What’s happening in the park in early May 2009. So far this year, one snowy plover nest is being monitored. Enclosures of string and metal fencing along the Great Beach are reminders of where they are attempting to nest, please avoid these areas, look for the annual closures signs especially from Kehoe Beach South to North Beach. Springtime is also the beginning of annual bat monitoring – a healthy 212 Townsend Big eared bats in the first Olema Valley counts. Spotted owl nest counts in older growth woods are also positive this year! The usual sign of spring at Bear Valley – the gopher hunting great blue heron appeared last week. This week is also peak harbor seal season – Bolinas Lagoon and the Estero Trail are good spots to observe from a safe distance. 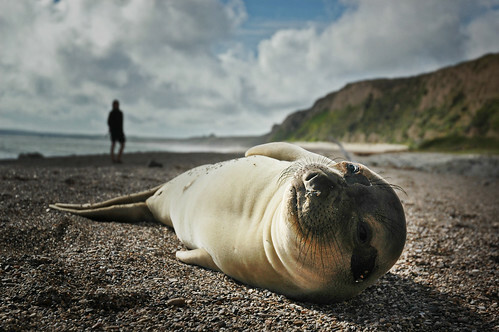 Or the newly repaired film at Bear Valley Visitor Center has some great images of onshore antics of these marine mammals. New photography show at Bear Valley Visitor Center is nature images by Kevin Shea going up this week! These are highlights from the National Park Service Park Wavelengths newsletter. What a wonderful photograph. I spent many years living in the Bay Area and Pt. Reyes was always my get away from it all destination. Having found your site at least lets me armchair travel back to one of my favorite places on earth. Thanks so much. You are welcome. Hope you find you back to this part of the world sometime soon.